Save £50 on Apple iPad Pro 10.5in for Black Friday | What Hi-Fi? Apple is offering its own Black Friday Apple deals on select new iPads (as well as its HomePod, iPhone and Apple TV 4K), but other retailers are offering discounts on older-gen Apple products. One that has particularly caught our eye is a £50 saving on the 2017 10.5in Apple iPad Pro, making it only £569. 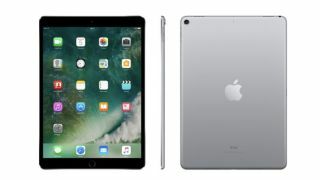 We've seen the deal at Currys and John Lewis, with the latter also offering £10 off the Apple Pencil when you buy this (or any) iPad. Simply enter promotional code APPLEPENCIL at the John Lewis checkout to receive the discount. There are several iterations of this iPad, and this is the 64GB wi-fi version available in a choice of Space Grey, Silver, Gold and Rose Gold finishes. The cheapest cellular version is £699, while the 256GB option is £709 and the 512GB variant is £839.